The Local Government Association (LGA) has called for legislation requiring all restaurants and takeaway outlets in England to display their food hygiene scores prominently to customers. The organisation that represents councils in England said that the rule should be introduced as part of post-Brexit trade legislation. Currently, local authorities carry out hygiene inspections on all businesses that prepare and sell food and publish the results on the internet, but English restaurants and takeaways are under no obligation to display the food hygiene ratings. The mandatory ‘Scores on the Doors’ legislation is already in place in Wales where it demonstrates hygiene standards to the paying public. 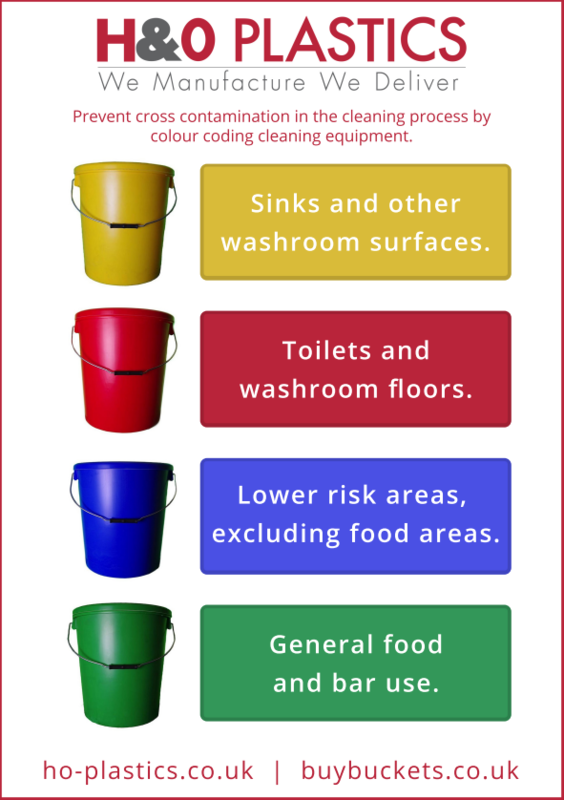 H&O Plastics has produced a colour coded cleaning poster to help hospitality clients ensure that proper hygiene measures are followed in sensitive environments. H&O Plastics supply plastic buckets to hundreds of hygiene-conscious catering firms every year. Because we manufacture all our own products, it puts us in a unique position to be flexible around client demands. We can create and deliver high-quality containers in dozens of different styles, sizes, and importantly, colours. Colour-coding is an integral part of any kitchen’s hygiene policy, and because we can deliver small-batch orders in lots of different colours, it makes us valuable supply partners for caterers. Colour-coordinating your cleaning products helps prevent cross-contamination in sensitive environments. 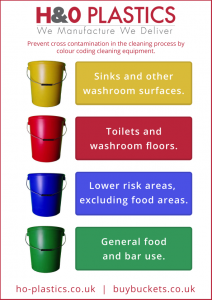 Designating certain coloured products to certain areas (such as red cleaning products in washrooms) helps prevent the spread of germs into food preparation areas. You should try to source different coloured cleaning products like brushes, cloths and, of course, buckets and put strict policies in place to prevent staff from cross-contaminating surfaces. You may wish to designate your own colours to specific operations or processes. For example, if you operate a bar, you may want to designate specific colours for carrying ice and, if you run a restaurant, you may wish to designate certain colours to store certain types of food. This is critical in this industry because it means that containers can be sent to foreign countries where certain handlers may not be able to read attached labels. Good food storage is integral to passing your ‘Scores on the Doors’ inspection. H&O Plastics sell a special range of clear plastic food storage containers in different sizes to help caterers prepare food ahead of time and store it hygienically. The containers are all made from food grade plastic, meaning they meet international standards for the safe storage of food. 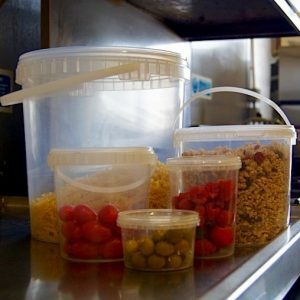 The containers also have lids, so you don’t have to have uncovered food in storage areas and you can better ensure that there is no cross-contamination between foods. These lids are tamper evident meaning that they can be sent out to customers or third parties while retaining the product’s integrity.